Aluminum alloy frame won’t bend, twist or break. Secured within our “winged” handle for additional stability. Handle easily connects to a standard size pool pole with built-in quick connect clip. 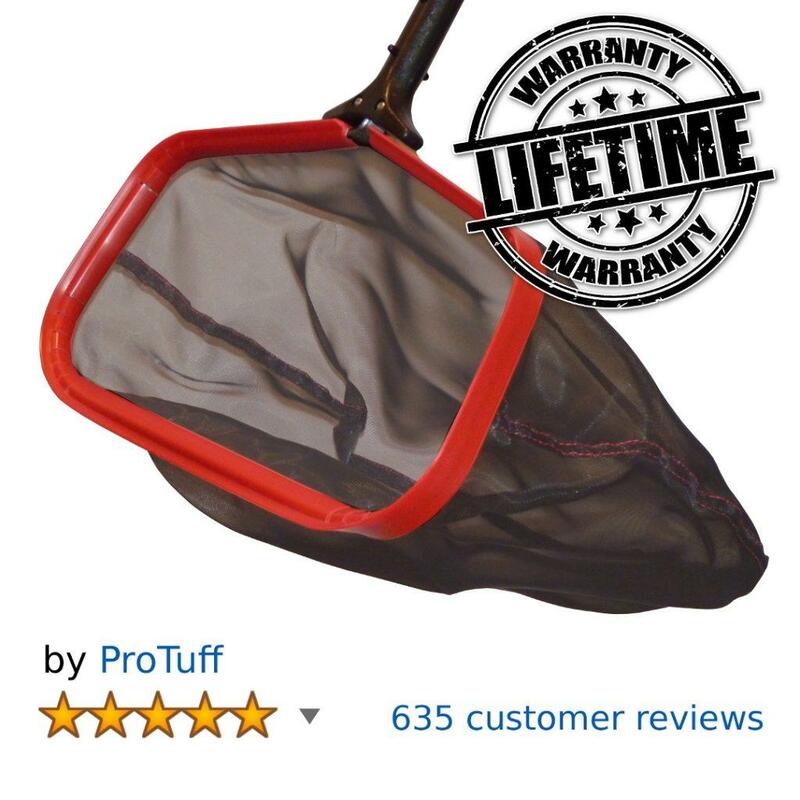 Deep, durable, abrasion resistant, double-stitched nylon net bag is stronger and more abrasion resistant than other double layer polypropylene pool rake nets. Tapered for easy maneuverability. Resists mold and mildew well, maintains it’s integrity and handles big swimming pool clean-ups with ease. Medium mesh size will filter out leaves, insects & small debris, but doesn’t quite “plug the door” on silt and very small particles. Deep, durable, double-stitched, fine mesh netting is stronger and more abrasion resistant than silt netting offered on other rakes. Easy maneuverability due to tapered shape. Maintains it’s integrity and handles big swimming pool clean-ups with ease. Fine mesh size will grab sand, silt, pollen, small insects and bugs. Not ideal for sharper objects like twigs & such. Long lasting, professional duty plastic rim is safe for all types of pools and will guard against marring or scratching of pool surfaces. “Easy Glide” Scoop front for quick & easy leaf pickup from pool bottom. Straight sides with slight angle for easy cleaning of pool sides, whether round or rectangular pools. Of our 635 Amazon reviews, 92% of them are 5 star and another 4% are 4 star ratings. That means an astonishing 96% of our customers have rated our pool rake 4 stars or better. More importantly, 611 of those reviews are “verified purchase“ reviews from customers that did NOT receive a discount for a review. Of our 26 Amazon reviews, 92% of them are 5 star and another 4% are 4 star ratings. That means that 96% of our customers have rated our pool rake 4 stars or better. More importantly, 25 of those reviews are “verified purchase” reviews from customers that did NOT receive a discount for a review. The lifetime guarantee is simple. No gotchas. No questions. No exclusions. If it breaks, we replace it. We don’t care why. 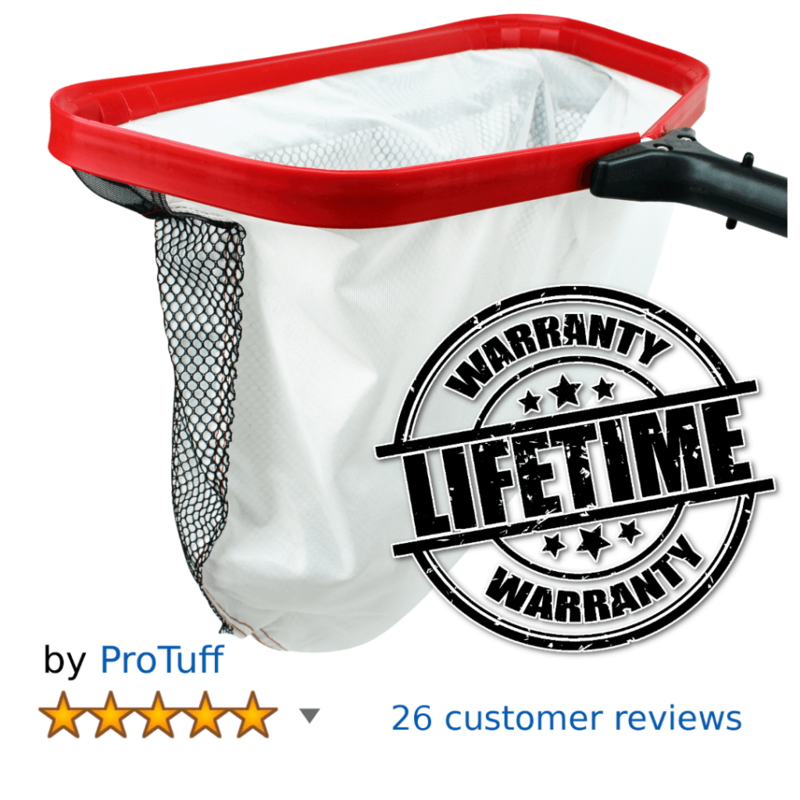 Use it to catch raccoons if you like. When it breaks, we’ll send you a new one. Register the warranty and we guarantee you get the replacement in 3 days. Note: Please be sure to leave us an Amazon review (positive or negative). It helps us improve our products. Thanks so much. Save $1000 per Year on Water Circulation Costs! Copyright © 2019 ProTuff Products. Powered by WordPress. Theme: Spacious by ThemeGrill.